If anything seems self-evident about recent American politics, it is the fact that our discourse and policy debates have become more polarized. Commentators and politicians seem to have moved to more extreme positions over time so that bipartisanship and compromise are all but impossible. As for rational, honest and fact-based debate about policies like taxes, healthcare, or Social Security in the Congress -- forget it. Instead we have strident conspiracy theories, ignorant birthers with funny hair, and hateful shrieking about the President -- all intended, presumably, to whip up the faithful. That's how things look to us as participants in the American scene. Is it possible to study this question with some degree of scientific objectivity and clarity? Can we measure polarization? Somewhat surprisingly (to me anyway) it is possible, and political scientists Nolan McCarty, Keith Poole, and Howard Rosenthal present their often surprising findings in Polarized America: The Dance of Ideology and Unequal Riches (Walras-Pareto Lectures). The biggest surprise in the research for me is that it is possible to create an instrument for "measuring" the political positions taken by legislators over their elected careers based on the totality of their voting records. It is then possible to observe the process of separation and polarization of individuals, groups, and parties over time. Along with other researchers in the field, the authors have applied a comprehensive statistical measure of relative positions on one (or two) dimensions, based on a complete set of roll call votes. Using roll call data, they compute an "ideal point" for each legislator along a scale of -1.0-1.0. This approach is a powerful one that permits calculation of a legislator's score from liberal to conservative. 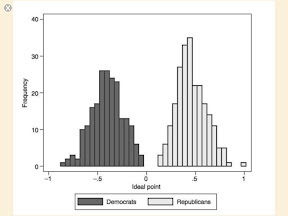 This permits comparison of the liberalness / conservativeness of legislators, including those whose careers did not overlap, and it allows an aggregate assessment of the relative positions of the parties over time. A second dimension of political ideology they consider is race and civil rights issues. They find that adding this dimension increases the classification success of the system -- but only by a few percent. The salience of the race dimension peaked in the late 1960s, adding 6% and 8% classification success for the House and Senate respectively in 1965, but then declined sharply to under 1% for both houses by 2005. Their results are very striking. Here are a couple of graphs that tell the main story of their results. 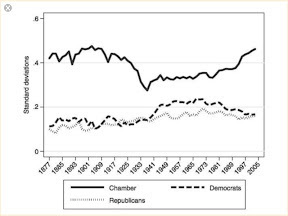 The first graph measures the standard deviations of the Chamber, the Democrats, and the Republicans. The graph demonstrates the widening separation of the Chamber as a whole and the narrowing of division within the parties, culminating a process of separation that began in the seventies. The parties become more unified and the Chamber becomes more sharply divided between them. And the second graph demonstrates the complete separation between the parties on ideological grounds. There are no cross-over politicians. Once the authors have worked out a measure of political ideology for each legislator and party, they are also interested in assessing causes. Why has the ideological distance between the parties increased so dramatically since the 1970s? The most important cause they consider over time is degree of income stratification present at a point in time (national inequalities). The results are genuinely striking. Through a series of graphs they demonstrate a very high degree of correlation between polarization and inequalities. And they argue that this is causal: politics has become more polarized as the stakes rise for those at the upper part of the distribution. They also argue strongly that the polarization of politics tracks relative income levels: more conservative policies are supported by higher-income voters and more redistributive policies are supported by lower-income voters. More bluntly: the higher the income of the voter the greater the likelihood of conservative voting behavior. Policy appears not to have followed this logic, given that median income has fallen in recent years as inequalities have ramped up. In chapter 4 they argue that this has to do with the increasing numbers of poor non-citizens. Non-citizens can't vote, and therefore their interests are not reflected in policy competition between members of Congress. So immigration has an unexpected consequence for policy: though the percent of poor people in the country increases, policy becomes more anti-poor. The book is a remarkable and complex argument in which the authors use sophisticated statistical tools to tease out connections between their core data set -- the ideological scores of virtually all national-level legislators since the 1870s -- and other factors (constituency characteristics, party, personal characteristics, etc.). They succeed in cutting through the seemingly crazed rhetoric of conservative extremists in and out of Congress and reveal what it's really all about: protecting the economic interests of the wealthy. For all its quiet restrained tone, it's an important contribution to the Occupy argument. What is really interesting about this analysis is that it implies that the sizzling rhetoric coming from the right -- personal attacks on the President, anti-gay rants, renewed heat around abortion and contraception -- is just window dressing. By the evidence of voting records, what the right really cares about is economic issues favoring the affluent -- tax cuts, reduced social spending, reduced regulation of business activity, and estate taxes. This isn't to say that the enraged cultural commentators aren't sincere about their personal belief -- who knows? But the policies of their party are very consistent, in the analysis offered here. Maybe the best way of understanding the extremist pundits is as a class of well-paid entertainers, riffing on themes of hatred and cultural fundamentalism that have nothing to do with the real goals of their party. All I can say is that this is simply some evidence supporting what has been obvious to anyone with half a brain for at least the past decade- the GOP is nothing more than a corporate lobbying arm of the plutocrats masking itself as a political party. All the noise it makes is meant to distract from its true intentions which is to enrich the rich at any expense. I agree, but the Democrats--Obama included--perform the same function with a different libretto. The Dems perform a similar, but not the same, function. There are still semi-powerful constituencies inside the tent (Labor, environmentalists) that force some anti-corporatist policies out of the Democrats. At least for now. Good post; but, yes, it does bolster the documentation of what is evident. However, there are certain issues on which both parties in congress agree: TBTF bailouts, surveillance, encroachment of liberties, the unitary executive, corporatism, political repression, and so forth. And their legitimacy is waning as they refuse/are unable to articulate and address real issues: energy, inequality, ecological degradation, economic collapse. Dale responds: Ideological polarization is the face of class polarization, based on diverging incomes, or the program of increasing inequality. One small class takes all new wealth (often based on new taxpayer funded technologies like the internet, GPS, and satellite technology, plus 1/3 of the workers median wages. Median wages have declined by 30% since Reaganomics, which ended the era of shared prosperity and replaced it with engineered inequality and as a result ideological polarization. Class warfare, in the 21st Century, is a way of appropriating wealth created by labor through a legal/tax system controlled by the ruling class. Then, to defend this theft, the ruling class uses its wealth to support propaganda the goal of which is to get the poor fighting each other over wedge issues unrelated to their actual common condition of being ripped off by the rich. This divide and conquer technique uses the corporate media to spread its divisive narrative , framing the debate in such a way that the fighting parties are not the 1% and the 99% but the 99% fighting each other, as the 1% picks their pockets. Class warfare was invented as a way to enrich the rich by taking from the working poor. When workers fight back, they are called out for "class warfare...a Marxist idea." This reduces analysis to name-calling. 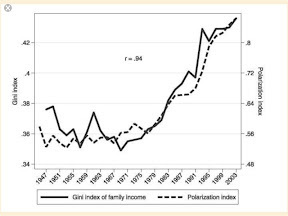 Ideological polarization tracks with income/wealth polarization. In this case, the facts are Marxist.